Unicorn brushes have been all the rage on social media. There have been different companies who have made unicorn inspired makeup brushes and are in high demand. I wanted a set I saw randomly on Instagram but had to hold back since they were a bit pricey. When Tarte released their announcement of these brushes I imminently ran to my laptop and bought them. Why? Well because they are a great trusted company. Tarte's quality is impeccable and one of my top five favorite makeup brands. I have never been disappointed with any of their products. I knew these would be a great investment as apposed to those other brushes. I have had brushes before which easily bleed or shed, so I wanted to put these to the test. Aside from their beauty I wanted to see if these would be efficient. My biggest worry is wether they would bleed when washed. That's one of the main reasons companies stay away from dyed brushes. I washed right away and noticed they passed the test. No bleeding at all. I also worry they will shed when applying makeup. They wouldn't have been a deal breaker for that reason but it's just plain annoying. After playing over and over with the brushes all of the bristles stayed in tact except for about two synthetic hairs that came off. That was pretty normal. They are extremely soft and well dense. They are synthetic, which can used to apply both liquid and powders. The bonus is that they are vegan, cruelty free, and dermatologist tested. The handles can be a bit slippery since they spiral down and can be awkward in your hand. I noticed this because I just got done putting on lotion since the hardware is metal. But, I promised you won't even notice, unless you are being extra picky and want to critic everything. Other than that they are pretty much perfect. I highly recommend them. Hurry before they sell out! 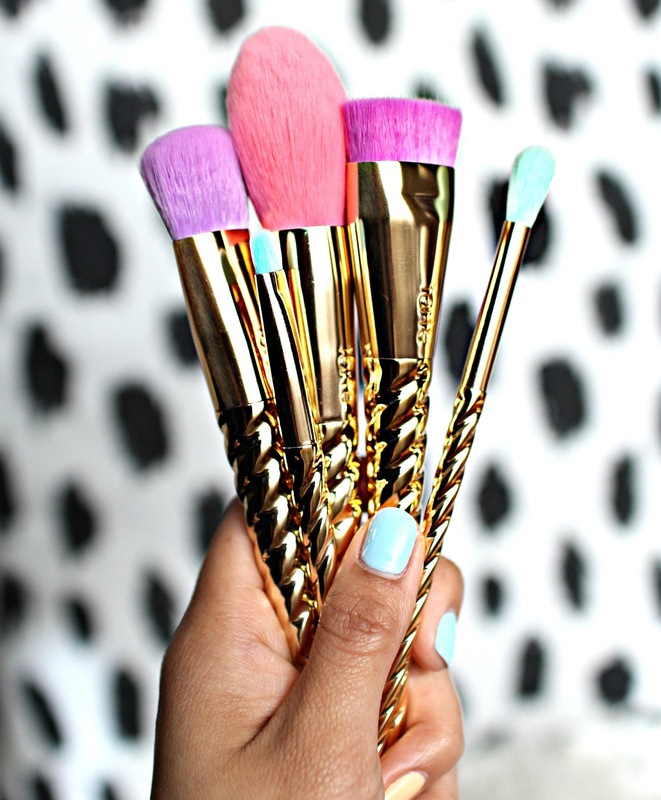 I love this Unicorn brushes. You look so cute with violet lipstick. Ha ha you are so sweet! Thank you, I was so excited to use purple lipstick. I was feeling extra magical. I love the foundation brush that comes with this set and am looking a similar one, just wondering if you have any suggestions. The best brush ever! I think this brush from tarte is the cutest I’ve ever owned. The brushes are soft. Very satisfied with this brush. Keep on making cute brushes like this!